Capo Testa is a large rocky promontory linked by a peninsula on the outskirts of Santa Teresa. It is great for walking with spectacular views over the straits of Bonifacio between Corsica and Sardinia. The Valley of the Moon is especially worth a visit to sample the views and the stunning evening sunsets. There are a selection of bars and restaurants to choose from and the beaches are some of the best in Sardinia with crystal clear water and white sand. Delightful, best describes this original fishing village on the northernmost tip of Sardinia. Fine white sandy beaches and secluded bays. Now a lively town offering traditional shopping facilities and a variety of restaurants, great walks and a ferry point for Corsica. In the northern part of Sardegna, take either SP90 or or Ss133b to SP90 into Santa Teresa Di Gallura. 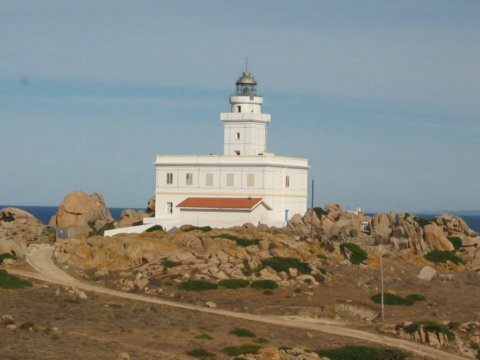 Once there find your way to Capo Testa and the lighthouse.